After posting my first drive review of the new 2017 Hyundai Elantra sedan, we received several questions about the 5-door Elantra GT and while the GT model doesn’t join the sedan in the refresh – this sporty compact 5-door is just as good as ever. 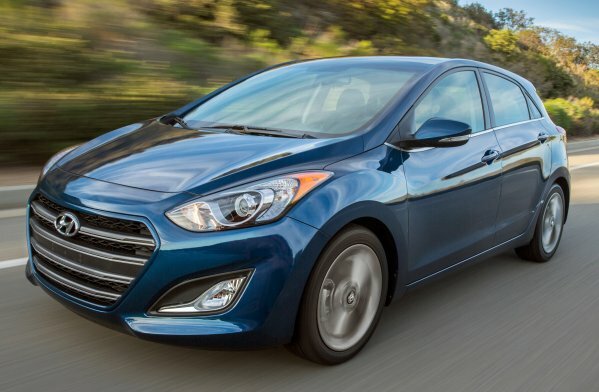 Compared to muscle cars or pickup trucks, compact hatchback 5-doors like the 2016 Hyundai Elantra GT don’t get the same level of enthusiast demand, but as cars in this segment go, I have always seen a great deal of enthusiasm from Elantra GT owners. Every Elantra GT owner I’ve met loved the car and having had the pleasure of driving the sporty 5-door in the past, I understand why owners enjoy the car so much. Not surprisingly, when I drove the new 2017 Hyundai Elantra sedan earlier this year, I received inquiries from a handful of readers who wanted to know if there the 5-door models would be subject to the same changes as the new sedan. Right now, the answer is no. The Elantra GT on sale at your local dealership is the same as the 2015 models and it is totally unlike the 2017 Elantra sedan – but that isn’t a bad thing. For the time being, the Elantra GT is the same loveable 5-door that it has been for a few years and – most notably – the GT offers more power than the new sedan. My 2016 Hyundai Elantra GT test car was fitted with the 6-speed automatic transmission, the Style Package and the Tech Package, so aside from some simple accessories like floor mats and wheel locks, this car is as loaded as the Elantra GT gets. Heated and cooled leather front seats, a panoramic sunroof, a touchscreen infotainment system with navigation, keyless entry, push button start, a 173hp 2.0L engine mated to an automatic transmission and sport tuned suspension for just $26,675. The 2016 Hyundai Elantra GT looks a great deal like the 2015 models, but the newest model year adds a slightly redesigned grille and a new design to the optional 17 inch wheels – but the overall car remains unchanged for the new model years on the outside. The new grille with horizontal bars running between the LED-trimmed headlights gives the 2016 Elantra GT a more upscale look while the 17 inch wheels are a little sporty and a little upscale for the compact segment. Im not sure if there is a segment in the US auto industry that has evolved more than that of the 5-door hatchbacks. A few decades back, driving a 5-door hatchback in the US meant that you were driving something like a Chevrolet Chevette wagon, with a bare metal dash, cardboard and rubber door panels, bench seats, tons of space and – if you were lucky – a tape deck. Back in the day, compact 5-door hatchbacks were tragically unhip and relatively disinteresting to drive, putting all of their emphasis on efficiency even though they weren’t all that efficient. The 2016 Hyundai Elantra GT continues to be everything good about the old school compact hatchbacks and everything that they were not – with tons of space for passengers and cargo (like the old compact wagons) and tons of modern technology coupled with a far more engaging driving experience than anything from the era of vehicles that caused the stigma against “station wagons” in the US. The Elantra GT comes with an impressive list of standard features including heated front seats, Bluetooth connectivity and steering wheel mounted audio controls for a standard MSRP of $19,800, but if you opt up to the Style Package and the Tech Package, the interior includes a great many features once reserved for luxury sedans. The Style Package adds 17 inch aluminum wheels, fog lights, sport tuned suspension, a leather wrapped steering wheel and shifter, aluminum pedals, power driver’s seat controls, the Proximity Key system with push button start and a few other smaller items like a rear cargo storage compartment and auto driver’s window-up. I would call this package a must have, specifically for the sport tuned suspension, the fog lights and the push button start. The Tech Package adds the Panoramic sunroof, leather front and rear seats, a 7 inch infotainment touchscreen with navigation, a back camera, automatic headlights, LED taillights, cooled front seats and dual zone climate control. At $3,950, this is the far more expensive package of the two, but I consider the infotainment system, the panoramic sunroof and the cooled front seats to be essentials. Also, when you consider the final price as tested, getting all of this for under $27,000 makes this sporty 5-door a great bargain. The infotainment screen is mounted high on the dash so that the driver doesn’t look far from the road to check the navigation or radio information, with a few buttons and knobs along the sides of the screen aiding in the easy to use nature of the system. Just below the big touchscreen is the climate control system, all of which is straightforward and user friendly, so there is no learning curve to turn on the AC or the windshield defroster. In addition to the interior gadgets, the gorgeous sunroof and the comfortable leather seats, the 2016 Elantra GT offers solid passenger space for the driver and the three main passenger spots. When the front seats are adjusted to comfortably seat two 6 foot tall adults, there is enough legroom in the rear outboard seats to accommodate a couple more adults in the 5-6 foot tall range. Also, thanks to the long roofline of the 5-door design, the folks sitting in the rear seat will enjoy more headroom. Keep in mind, this is a compact car, so I don’t know that I would recommend that four 6’4” guys make a drive from New York to Vegas, but a family of four won’t be cramped in the Elantra GT – nor will four guys headed to do some tailgating before a college football game. The 2016 Hyundai Elantra GT is powered by a 2.0L engine with 173 horsepower and 154lb-ft of torque, making it the most powerful vehicle wearing the Elantra badge right now. I admit that were I to buy a GT right now, I would opt for the 6-speed manual transmission, but the automatic transmission in my test car doesn’t hinder performance much. You don’t get the gear banging fun of the manual, but with 173hp and 154lb-ft of torque, the Elantra GT with the automatic transmission offers solid acceleration from a stop and through the midrange. You aren’t going to confuse the Elantra GT for a high performance hot hatch, but when you factor in the sport tuned suspension, the 5-door model will satisfy your need for speed a bit better than the new sedan. I spent some time cruising around rural central Michigan and while the 2.0L engine doesn’t make this 5-door a drag racing beast, it does pack enough power to make the GT fun to drive on a twisty back road. The adjustable steering system features a Sport mode that gives the driver better feel for the road and the sport tuned suspension allows you to hit the turns with confidence. Around town, the sport tuned suspension allows the Elantra GT to move smoothly through tight quarters and out on the open road, it is very stable even on long, sweeping turns at speeds over 70mph. Best of all, the suspension setup is tuned in a way that affords the Elantra GT a very comfortable ride even on Metro Detroit’s bumpy highways, so you can enjoy the nimble handling without compromising ride quality. Just to be clear, the Elantra GT isn’t a performance vehicle with space for four adults and cargo. This is an economy 5-door hatchback that has been engineered to maintain the functionality of a fuel-friendly compact while also being fun to drive. Shy of the Veloster Turbo models, the Elantra GT is, in my opinion, the most entertaining of the small Hyundais to drive, but it is still smooth, quiet and comfortable enough to serve as an ideal daily driver for a small family. The biggest shortcoming of the 2016 Elantra GT compared to the 2017 Elantra sedan is at the gas pump. Where the sedan with the new 2.0L engine and 147hp offers 29mpg around town, 38mpg on the highway and 33mpg combined (with the automatic transmission), the Elantra GT with the self-shifting transmission and the more powerful 2.0L engine is “only” rated at 24mpg around town, 33mpg on the highway and 27mpg combined. In my tests, I found that these EPA figures are very realistic, but opting for the 5-door over the sedan will “cost” you around 5mpg around town, 5mpg on the highway and 6mpg combined. If you demand the better fuel economy and you don’t care about the extra power or space of the 5-door, the 2017 Elantra sedan is your better but – but if you want a car that is more fun to drive and roomier, the Elantra GT is the Hyundai for you. The 2017 Hyundai Elantra sedan is all new and while it has some advantages over the carry-over Elantra GT, the sporty 5-door still offers some features that you can’t get from the new sedan. The Elantra GT offers more seating space and gobs more cargo space than the sedan, while the 5-door model offers more power and a more engaging driving experience when you get a chance to push this Hyundai hatchback to its performance limits. We are seeing a gradual resurgence in the American compact 5-door (dare I call it a station wagon?) with more entries in the segment each year, but those shoppers who want a roomy compact 5-door with premium interior amenities, lots of fun to drive factor and a price tag under $27,000 when all loaded up will find that the 2016 Elantra GT is still one of the best options for the money.